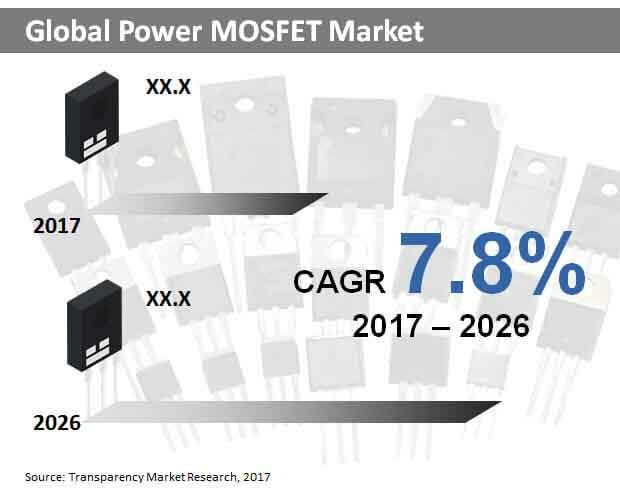 The global power metal oxide semiconductor field effect transistor (MOSFET) market is predicted in a report by Transparency Market Research (TMR) to find vendors focusing on reducing complexities in the production process. Asia Pacific could see consolidation of power MOSFET production as South Korea, China, and India pen supportive industrial policies. Panasonic, Hitachi, Mitsubishi Electric, Renesas, and Infineon are expected to make their presence known in the market. Furthermore, they could stay active in the expansion of the market. Acquisition and new product launch are anticipated to see common adoption as powerful strategies that promise business expansion. TMR foresees the global power MOSFET market to rise at a 7.8% CAGR between 2017 and 2026 to be worth a US$12.6 bn by the final forecast year. By type of channel, the market could witness the rise of P-channel power MOSFET growing at a CAGR of 8.2%. Regionally, Asia Pacific except Japan (APEJ) is envisaged to gather pace in the market. Power MOSFETs worth an over US$7.0 bn could be sold in the region by the end of 2026. MOSFET is used in electric vehicles and as part of renewable resources. It helps to improve switching speed and avoid power loss. One of the advantages of using MOSFET is improvement in energy saving as it empowers power management in industrial system, consumer electronics, and various other applications. Compatible with greater voltage and current when contrasted with bipolar junction transistor (BJT), it is used as a pocket-friendly solution. Furthermore, it finds application as an electronic switch gadget. Increase in manufacture of electronic gadgets in Asia Pacific could be another reason for increase in the growth of the world power MOSFET market. Furthermore, rapidly rising demand for compact automation solutions is forecasted to set the tone for significant market growth in the next few years. The international power MOSFET market is projected to stay strong in terms of revenue growth. However, current leakage and expensive execution cost could pose challenges to players operating in the market. Nonetheless, market opportunities are envisaged to take shape in the near future with the integration of human machine interface (HMI) with power MOSFET. Owing to improved strength and smaller size of power MOSFET, there could be impressive developments observed in the market. Adoption of power MOSFET is predicted to see a rise as a result of increasing awareness about its durability and enhanced effectiveness and swelling requirement of compact automation solutions. Applications such as consumer electronics could create ample of opportunities in the international power MOSFET market with improved parallel current sharing and high input impedance.